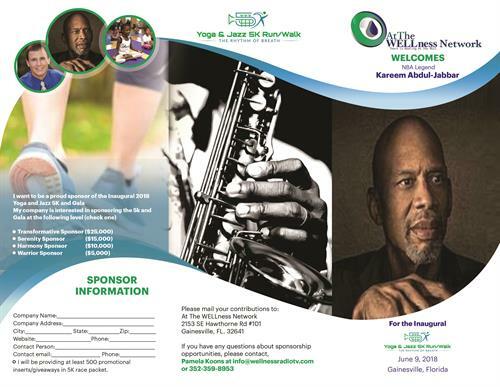 At The WELLness Network, Inc. is excited to welcome NBA Legend Kareem Abdul-Jabbar to Gainesville on June 9, 2018 for an unprecedented day of celebrating The Rhythm of Breath with the Yoga & Jazz Scholarship Gala. This is an exciting opportunity that you do not want to miss. Your philanthropic kindness will support both our Yoga Is 4Me2 Project providing the mindfulness of yogo to children in our deserving communities and the education of a University of Florida student in the College of Public Health and Health Professions through our Joe Cirulli Scholarship Award. This is a great Father's Day gift. Reserve your ticket early!